Inside Storey: BEA In Words and Cookies! BEA In Words and Cookies! Book Expo America is the biggest yearly gathering of booksellers, publishers, authors, agents, library folk...really, anyone who has anything to do with creating, marketing, selling, buying, or distributing a book is at BEA. New York played host this year; in the past, BEA has been held in Los Angeles, Chicago, Washington DC, Las Vegas, and Miami. For the foreseeable future, we'll be traveling to New York for this show. This year, the prognosticators were anticipating doom and gloom: fewer publishers, less booth space, no more free chotchkes for attendees, fewer galleys and advance reader copies being given away. There were some visible cost-cutting measures in place. Houghton Mifflin Harcourt didn't even have a booth this year, opting for a meeting room instead (with the BEST lunch ever, trucked in from Second Avenue Deli!). Random House's booth seemed to be merely a placeholder in the middle of the floor, with barely a catalog in sight, and Harper Collins opted to give out e-books and sim cards instead of galleys. 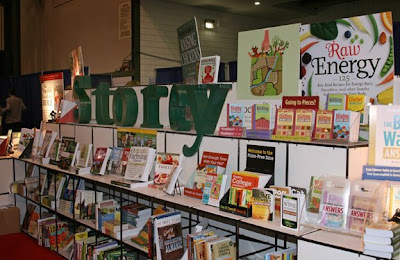 Storey's booth, on the other hand, was chock-full of wordy goodness, as you can see here. We gave away signed copies of The Backyard Homestead on Friday morning to kick off the show's opening. Editor Carleen Madigan gave out words of wisdom with each book, and it was nice to begin our time in New York with thoughts of home-grown vegetables and chickens in the backyard. We actually had an avian presence in our booth; it seems the Javits Center is home to about four million pigeons, and they aren't afraid of anything. The grossest thing you've ever seen is a pigeon WALKING THROUGH THE BOOTH (ick) as you're sitting in a meeting. 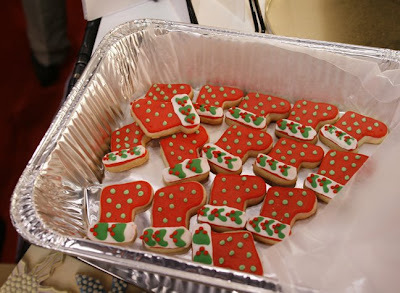 Friday afternoon, our Cookie Ladies, Janice Fryer and Valerie Peterson, gave away some exquisitely decorated holiday cookies to announce the publication of their upcoming Cookie Craft Christmas. 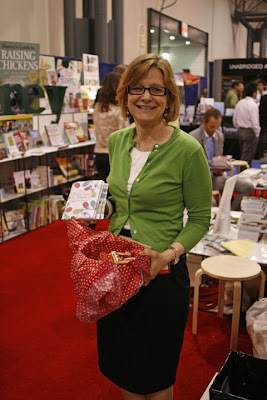 It's a beautiful stocking-stuffer of a book, and here are some pictures of author Janice and the loveliest edible stockings you've ever seen. Saturday kicked off with a flood of booksellers and media types. Sharon Bowers, who created the devilishly clever Ghoulish Goodies, signed copies of the just-finished book, and we gave away yummy chocolate-pretzel Funny Bones and Spicy Pumpkin Seeds. Everyone's happier with free food! Sunday was the final day of the show, and it's always a relief to pack up the booth and head for home. It was an incredibly productive three days in New York, and it's always fun to be in the Big City, but coming home to your own bed and a dog who licks your toes...priceless. See you next year in New York!